When and where Khabib Nurmagomedov was born? Khabib Abdulmanapovich Nurmagomedov (Russian: Хабиб Абдулманапович Нурмагомедов; Avar: ХIабиб ГӀабдулманапил НурмухӀамадов; born September 20, 1988) is a Russian mixed martial artist of Avar heritage. He is the current UFC Lightweight Champion. Nurmagomedov is also a two-time Combat Sambo World Champion and holds a black belt in Judo. He holds one of the longest undefeated streaks in MMA, with 26 wins, and is the first Russian and the first Muslim to win a UFC title. 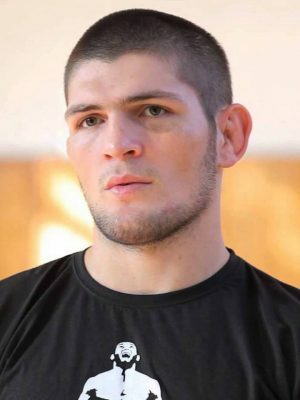 Khabib Nurmagomedov was born on September 20, 1988 in the village of Sildi in Tsumadinsky District in modern-day Dagestan, Russia, before moving to the state capital Makhachkala in his childhood, and then briefly in his older years to Kiev, Ukraine, where he trained at Combat Dobro. He is the second of three children, including an older brother Magomed and younger sister Amina. His father's family had moved from Sildi, Tsumadinsky District to Kirovaul, where his father converted the ground floor of their two-story building into a gym. Nurmagomedov grew up in the household with his siblings and cousins. His interest in martial arts began when watching students training at the gym. How tall and how much weigh Khabib Nurmagomedov?